“Like Dante, Michael’s second full length excels by digging to the core of human suffering. Electronic patches of otherworldly textures coupled with acoustic guitar sticking out from every corner of your dimlit room. Those thoughts you swore were yours and yours alone: right there, as though he was listening. If only you could word them like this and sing them like that. It’s true. He has one of the most beautifully soothing voices in the world.” – MILKBONE. Michael Plaster has once again, under the moniker Soul Whirling Somewhere, produced yet another highly emotional and heartwrenching album with Everyone Will Evenutally Leave You. The title is more than accurate in describing the mood. 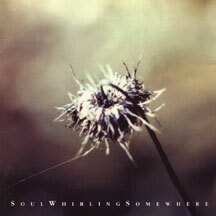 Whereas Soul Whirling Somewhere’s debut Eating The Sea was an intensely intimate recording, Everyone Will Evenutally Leave You has a more sombre and distant tone. The music, combining stark acoustic guitars with synths that move from deep, swirling sounds to spacey twinklings and drones, is much more distant than before; musically, I would compare it to albums such as the Cocteau Twins’ Victorialand. Plaster moves into ambient territory much more readily than before, but it is a cold, distant ambience. However, this does not decrease the beauty or the impact of the music one bit. Somehow, Plaster is able to combine these two elements into beautiful, minor-keyed symphonies that wash through your heart, evoking scenes of long-abandoned towns, stretches of desert highways, and the heartbreaks of your heart and soul. With Everyone Will Evenutally Leave You, Soul Whirling Somewhere creates another moving tribute to those times of longing and melancholy, without becoming overly pretentious and trite. I often wondered how he would follow up the masterpiece that was Eating The Sea. While not as immediately inviting as Eating The Sea, this album is just as satisfying and has my highest recommendation. Now, I find myself reaching for Everyone Will Eventually Leave You much more often than Eating The Sea.